From time to time, Google releases major updates to its search engine. The latest update, Caffeine, was announced in August 2009, and many site owners were understandably nervous. Back in 2003, the infamous Florida update had had disastrous effects for a large number of websites, seeing many drop out of search results altogether. Google was keen to avoid this happening again, so this time around it allowed web professionals to preview the new update before it was rolled out. Participants were actively encouraged to provide feedback on the rankings for specific websites, to help the search company iron out any blips. For site owners, meanwhile, the preview enabled them to see what impact the new update would have on their pages and try to remedy any SEO problems before the official release. The main objective behind the Caffeine update was to keep Google ahead in the search engine game by giving it a speed boost. Everyone expects search results to be fast, but as more pages are being added to the internet every day, Google's task is becoming increasingly difficult, so improvements to the search engine were vital. Along with speed, accuracy is a prime concern for users. When you enter a search request, you want to find the most relevant results. But as long as there are search engines, there'll be people trying to manipulate them with spam-like sites. These sites may make their owners a reasonable amount of money, but they also serve to annoy us searchers – and if we get too annoyed we try something else! Google wants to avoid this at all costs, and is constantly improving its systems to penalise such pages. Thirdly, with the rise of social networking, Google has been concentrating on making its search results more real-time. It has achieved this by integrating social networking feeds into its search results, along with other blended results such as maps, business listings, news and books. As soon as Caffeine was announced, it was available to users through a preview link provided by Google. This preview, however, wasn't completely finished and was updated as improvements were made. 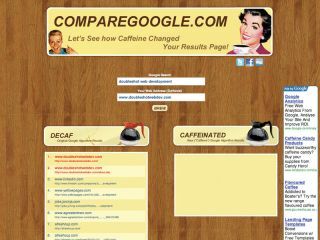 A number of websites have been set up to provide side-by-side comparisons between the old and new Google, including comparecaffeine.com, comparegoogle.com and facesaerch.com/caffeine. What's new in Google Caffeine? Google famously keeps its algorithm a closely guarded secret, so no one other than Google itself knows for sure exactly what's changed in Caffeine. Nor was it clear at the time of press how far Caffeine has actually been rolled out (see 'Is Caffeine live yet? ', below). Matt Cutts has stated that Caffeine places more importance on the speed of sites in its rankings. There are many factors that make a website fast in Google's eyes – everything from minimal HTML to server grunt will play a part. Domain authority is the measurement of how powerful your domain is as a whole. So, irrespective of how many links an individual page has or its PageRank, the domain as a whole is a bigger factor in Caffeine's rankings. With Caffeine, there's further and better use of blended results, including Twitter feeds, Facebook entries and MySpace updates. The Caffeine search engine seems to place more focus on a site's content than before. Naturally, inbound links still play an important role in SEO, but now even more importance is being placed on good content and avoiding spam-like techniques. If your domain name is brand new, you'll have more of a struggle now than before. That's because Caffeine places more importance on the age of your domain name – the amount of time since it was first registered. The Caffeine update to Google also appears to have given more weighting to domain names that contain the exact search phrase. For example, "www.studentrooms.co.uk" might rank higher now when "student rooms" is searched for. Google's index for a number of search phrases has increased. This isn't the case for all terms – some have even decreased – but generally the index is believed to be larger. With the extra emphasis on a site's content, spammy sites are being pushed down the search results. Searches now take half the time they used to. For example, a search for 'Gordon Brown' on the old Google took 0.24 seconds, whereas now it only takes 0.16 seconds! Current page: What is Google Caffeine?